In the Pilbara region of Western Australia in the town of Dampier, there's a statue of a dog, a very special dog. And there are two films telling the story of this very special dog—Red Dog. Whether you’re in the suburbs, out in the bush or living in the city, dogs are universally cherished creatures. So it’s little wonder why the true story of hitchhiking, people-loving adventurer Red Dog has generated so much interest. It was the statue commissioned in order to commemorate the memory of this dog that generated all of the interest in the enigma that is Red Dog. This very statue prompted British novelist Louis de Bernières, author of "Corelli's Mandolin," to write the story of Red Dog. Known for writing a number of popular works, Bernières' tribute to this tremendous hound was, undoubtedly, in good hands. The first Red Dog film was based on Bernières' book. Living in the Pilbara region of Western Australia, Australia’s west coast, Red Dog was regarded as a universally loved figure amongst locals. Known simply as Red Dog, the red kelpie was known for stopping cars on the road by walking right in the path of the oncoming vehicle until it stopped and then he would hop in and travel to wherever the car's driver was going. He took bus rides as well and, once, when a new driver booted him off her bus, the passengers all disembarked in protest. Red Dog was born in the mining town of Paraburdoo in 1971 and became a much-loved member of the Pilbara community. He had many adventures, several owners, and died in 1979. Because he was so loved, the tale of Red Dog was adapted for the screen. Based on the book by British novelist Louis de Bernières, "Red Dog" the movie hit Australian cinemas in early August 2011. The film stars American actor Josh Lucas, Australia’s Rachael Taylor, Noah Taylor, and New Zealander Keisha Castle-Hughes. Red Dog was directed by Australian Kriv Stenders. The movie highlights the landscape and unique character of the Pilbara region as well as telling the story of Red Dog with humor and great affection. The award-winning "Red Dog: True Blue" was released in 2016. The story revolves around the friendship between a young boy and Red Dog. Red Dog was a fully paid member of the Transport Workers Union, an official member of the Dampier Salt Sports and Social Club, and had his own bank account. Red Dog's travels brought him as far south as the Western Australia capital of Perth but mostly among the mining communities of the Pilbara and the coastal towns of Dampier, Port Hedland, and Broome. He was quite well known as the "Pilbara Wanderer." Red Dog is portrayed in the first Red Dog movie by the red kelpie Koko, who bears a strong resemblance to Red Dog. De Bernières acknowledges his novel's sources as two factual accounts by Nancy Gillespie and Beverley Duckett, respectively, as well as press clippings in the Dampier and nearby Karratha local libraries. That said, the human characters in the book (and the movie) were mostly fictionalized. 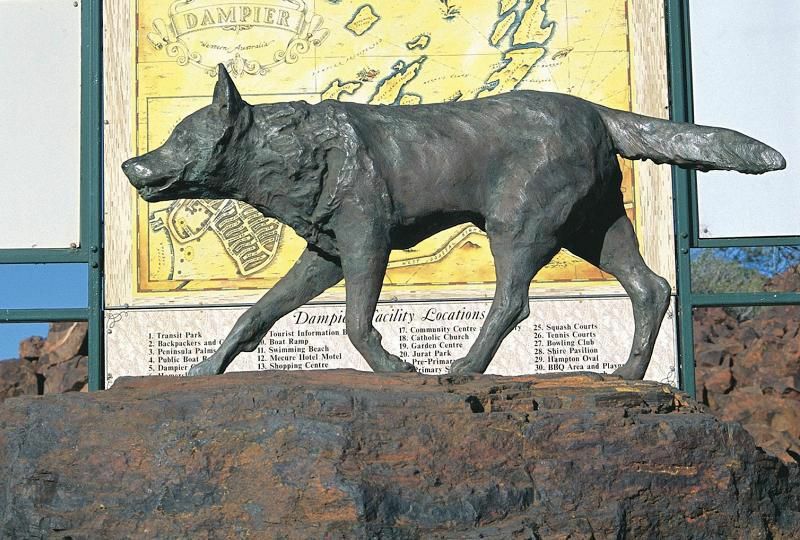 The Dampier statue of Red Dog is inscribed: "RED DOG, The Pilbara Wanderer. Died November 21st, 1979. Erected By The Many Friends Made During His Travels."